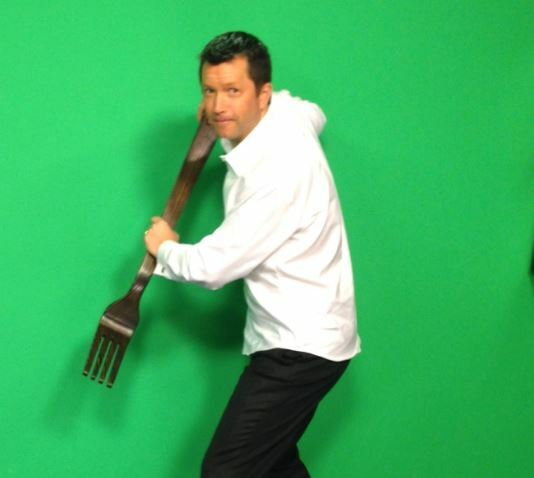 It’s time to stick a fork in this winter. It’s been a wild one, but I think for those of us living at the lowest elevations the winter is finished and ready to come out of the oven. Could we still get a snowstorm? EXTREMELY unlikely. 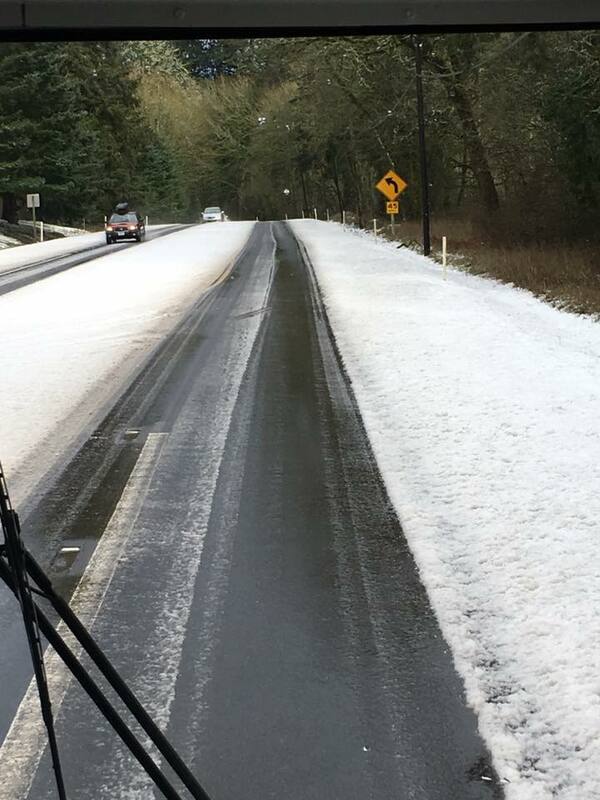 In March 2012 we had heavy/wet snow in the central/southern Willamette Valley mid-month, but it barely affected traffic in the lowest elevations of the metro area. We sure don’t get frozen roads during the daytime from this point forward, in fact we’ve never had a daytime high below freezing after March 3rd. You can take off your faucet covers since we’ve never had an “arctic blast” after the first few days of March. We might get a few light frosts but that’s it. 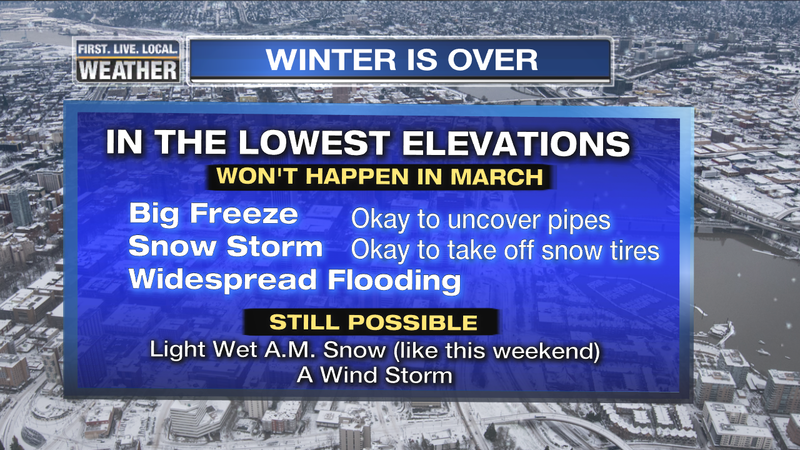 This also means IF YOU PLAN ON DRIVING ONLY IN THE LOWEST ELEVATIONS you can take off your snow tires. What parts of winter could we still see? Exactly what we’ve seen the past few days…a brief wet morning snow that doesn’t affect our driving. In fact that could happen several times in a cool March (Example = 2012). We can also get a wind storm in the month of March. That said, we haven’t had a wind storm since October! This has not been a winter with lots of south wind by any means. It’s been dominated by cool easterly flow…until now. Meteorological winter is defined as the three coldest months of the year. That is DECEMBER-JANUARY-FEBRUARY. As far as we are concerned spring in the northern hemisphere starts tomorrow. In fact in three weeks the sun will be halfway to its summer position so that seems perfectly reasonable. In other parts of the Pacific Northwest it was not as extreme. For most of us around the region it was the coldest since 1992-1993. 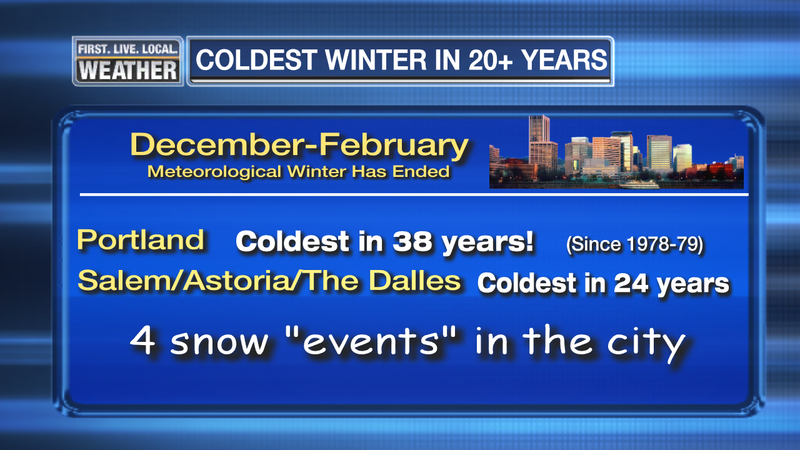 There are just a few locations that saw a colder winter within the past 10 years. 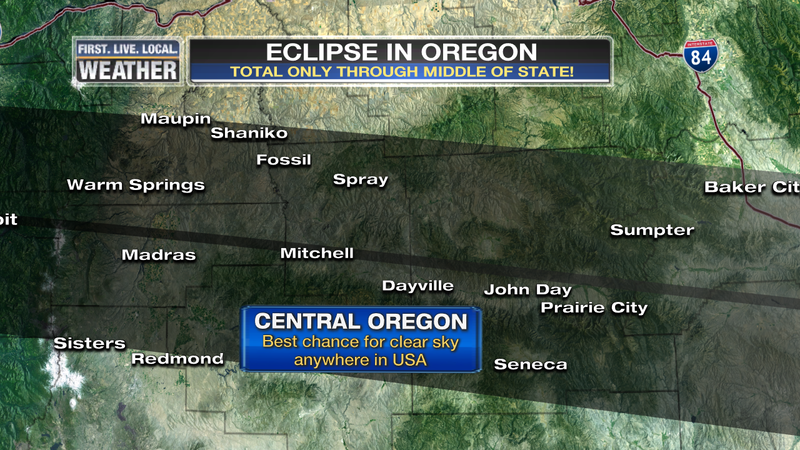 That includes Seattle, Roseburg, Eugene, Medford, & North Bend. The reason it was so cold was the thick snow cover that covered most lower elevations east of the Cascades from early December through early February. That kept a cold low-level airmass over the region much of the time, remember the almost constant easterly wind through the Gorge? 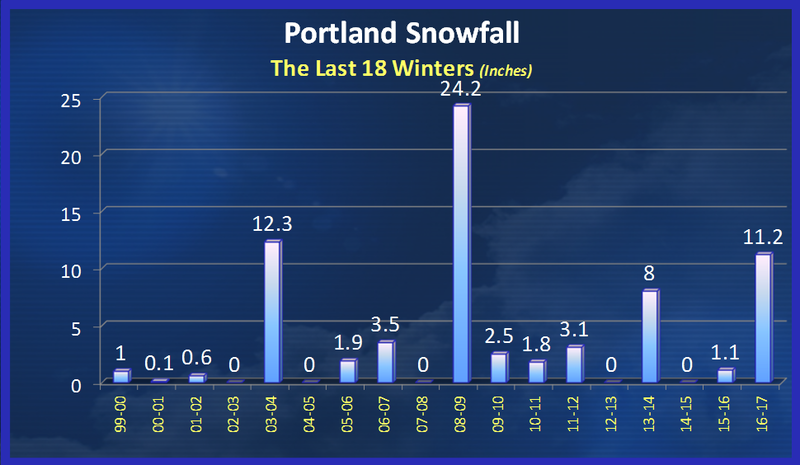 For the record, the official snowfall at the Portland NWS forecast office (the official Portland total) is 11.2″ so far and my gut feeling is that will be the final number this winter. The last time we saw measurable snow in the city was January 11th, the big snowstorm. By the way we are exactly tied with Seattle for snow this season. 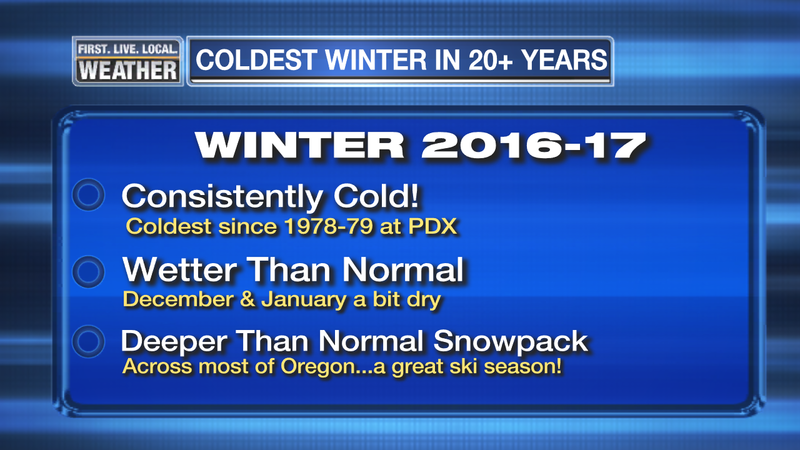 For the first time in my career (all of it has been in Portland these 26 years) Portland had 4 ice storms and Eugene had 2. Of course the thick icing was only in the eastern metro area and generally close to the Columbia River, but that’s normal. In just under 3 weeks the Oregon Chapter of the AMS will hold it’s annual winter recap meeting and I’ll be presenting far more information at that time. Afterward I’ll post a link to the presentation too. Stay warm the next 7+ days as we wait for that first 65 degree sunny day! And if you went up at any elevation (well below 1,000′) and got under heavy showers, you likely saw more than this. 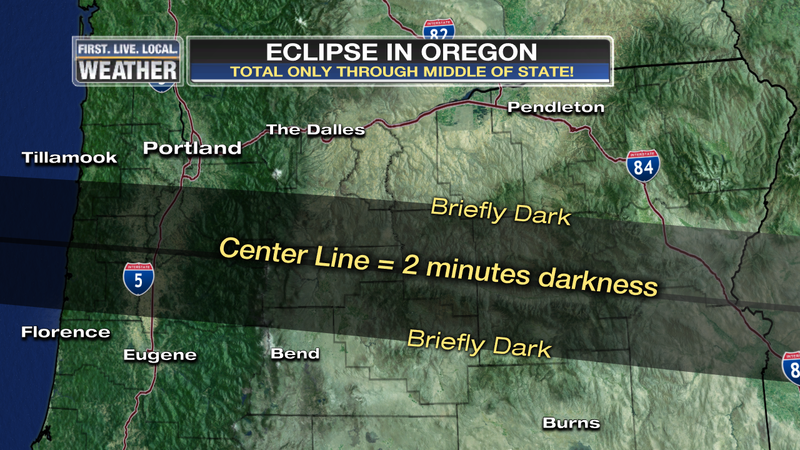 That includes the Coast Range and foothills of the Cascades. Our John Hendricks got this image during the morning hours in the West Hills. I think this location is somewhere around 700′. With the clouds and light showers, it’s pretty obvious March will be coming in like a lamb, not a lion. The saying of course refers to early March sometimes starting more like winter, but always ends on a calmer spring note. Regardless, I think the fork is coming out this week, I don’t see much winter left! Maybe something like this morning again, but that’s about it. As expected a mild southerly wind is blowing west of the Cascades this morning and has lifted the snow level up above 1,000′, actually closer to 1,500′. Here’s a good picture from home this morning at 8:45am. 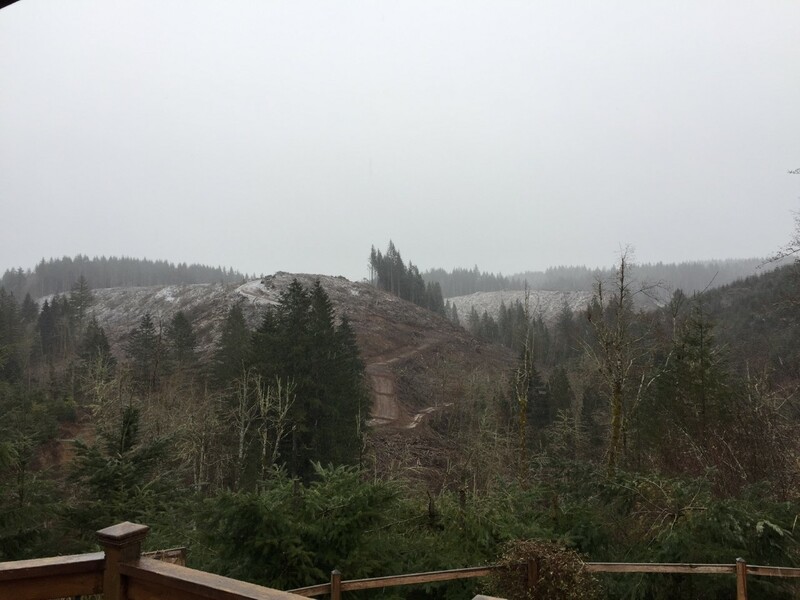 Always remember SOUTH WIND = NO SNOW in the lowest elevations of the Portland Metro Area. Okay, one time out of 10 we’ll get a dusting in this pattern. Or with a really cold airmass coming onshore a couple of inches can fall in the hills in this pattern, but it’s very rare. 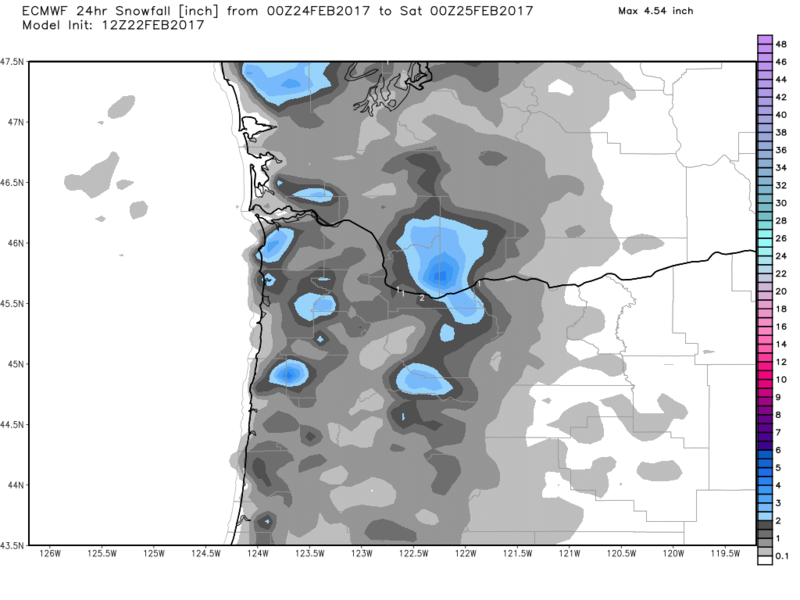 You either want calm conditions or of course the favored snow pattern with cold air already in place (calm) or pouring in out of the Gorge. Enjoy your Sunday! The steady rain/snow is about to change to showers and sunbreaks, it should be a much brighter afternoon. I’ll be back at work this evening and see you on-air at 10pm. Here in the metro area it hardly did anything at all and has been mainly dry. 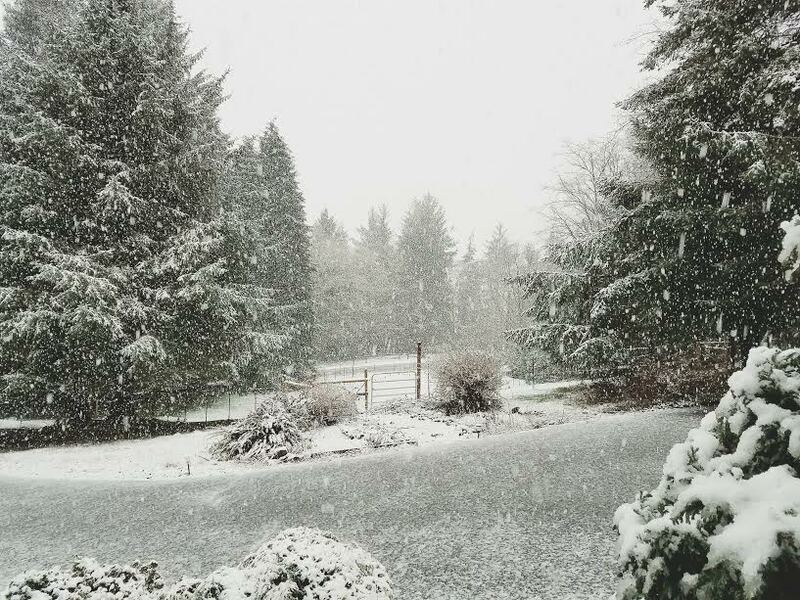 No measurable precipitation at Portland, Hillsboro, Troutdale, or Aurora through 10am. 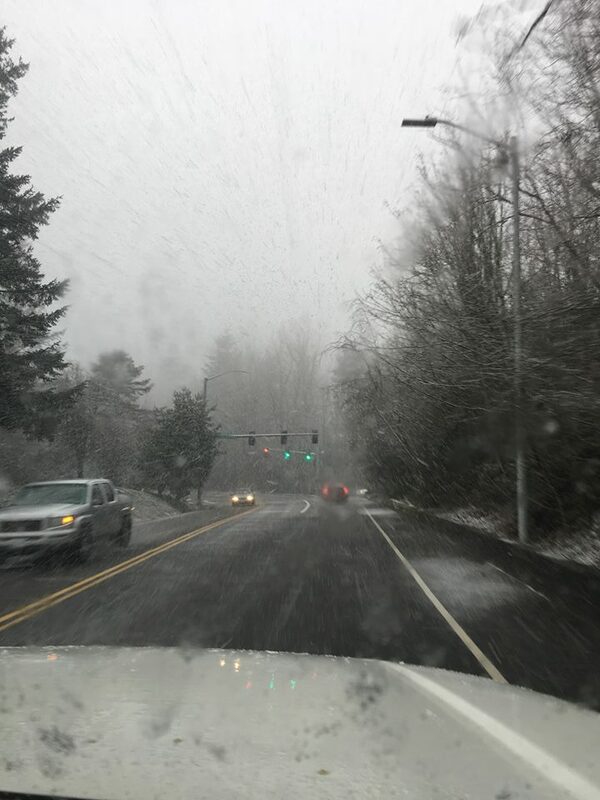 Sure, there were flurries and sprinkles around, but if the temperature is marginal for snow (32-34 degrees), you need some heavier snow showers to get it to stick (like in Pacific City pic above). Most models were showing very light precip, but so far it’s been even lighter than they showed. Luckily I didn’t jump on that wetter GFS model last night which implied several inches of snow west metro area today. Now the daytime “heating” has taken over and there’s no chance for sticking snow the rest of the day. 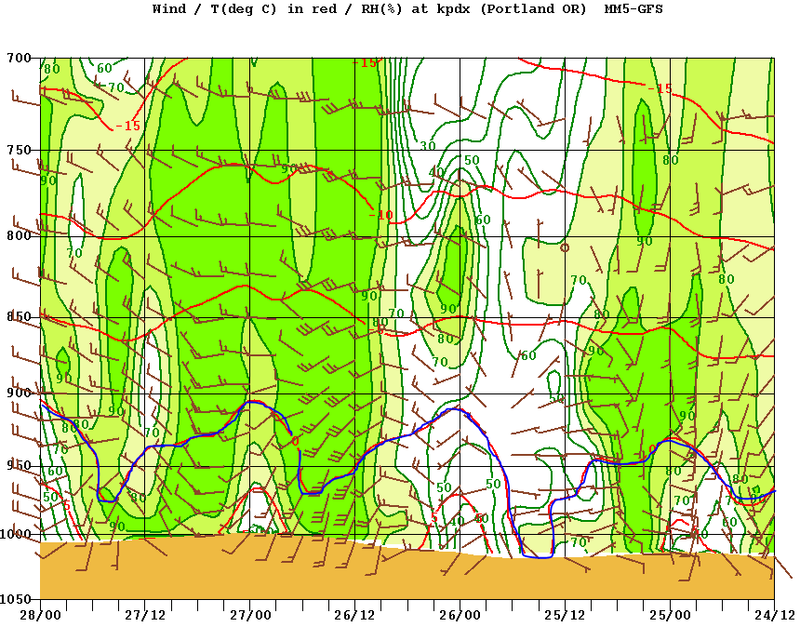 That is a cross-section showing the next 3.5 days temperature and relative humidity (green colors), along with wind barbs showing wind direction and speed. The blue line is zero degrees (celsius). You see the dip to sea level tomorrow (25/12 refers to 4am the 25th, Saturday). Then a dip close to sea level again both Sunday and Monday mornings. The reason I’m not real excited about low elevation snow Sunday is the southerly wind we’ll have on Sunday. That almost always keeps us a few degrees above freezing and that’ll likely happen Sunday morning. But that’s a day we’ll see lots of snow above 1,000′, could be a snowy drive into the Cascade Foothills and Coast Range too. Keep that in mind if you’re travelling on Sunday. It’s a cool day with temperatures just into the low-mid 40s this hour. At least it LOOKS like those brighter days of late winter even if it doesn’t FEEL like it. Many of us in the metro area will just stay dry or get flurries that barely stick. This is what we call a “conversational snow”; one that won’t affect most of our lives. 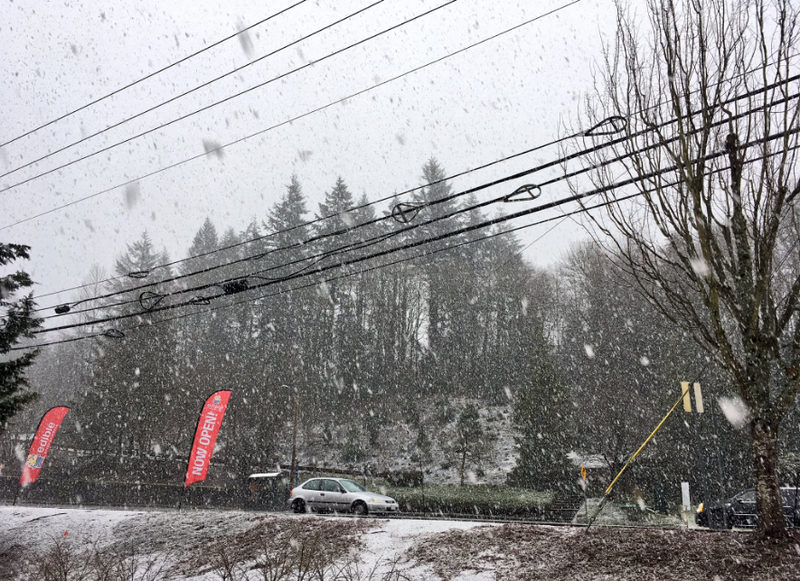 This is the snowiest spot…I expect 3-5″ in the Coast Range above 500′ or so. Camp 18 could be a winter wonderland by 10am! Expect snow-covered highways off/on throughout the day up there. The big issue with tomorrow is lack of moisture (if you want 1, 2, 3″ or more snow). A surface low pressure system will be dropping south along the coastline during the day, taking most of the showers with it offshore and over/west of the Coast Range. 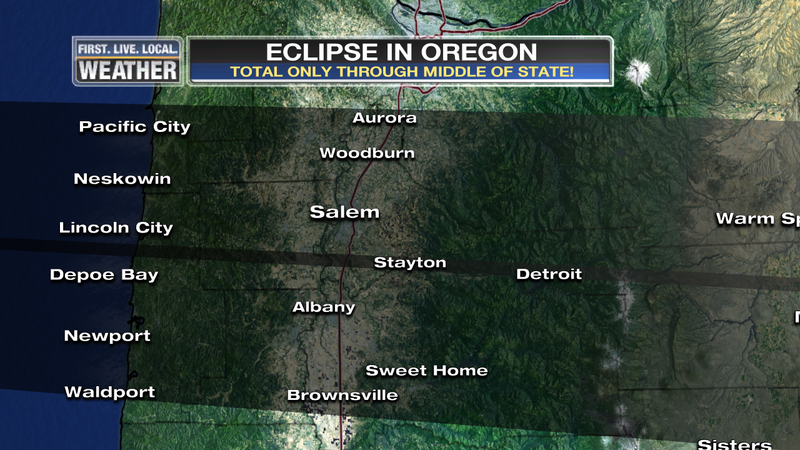 That leaves the main population centers of the Willamette Valley and SW Washington with very light precipitation. 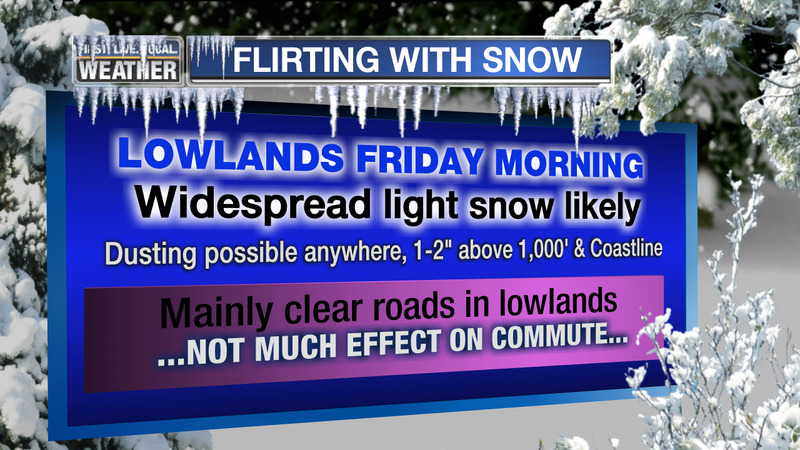 It will be cold enough between late tonight and around 10am tomorrow for snow to stick all the way down to sea level. Beyond that time (midday and afternoon), it’ll be too warm for snow to stick at the lowest elevations. That’s it for now, just got in from a school visit (very late!) and I’ll be on the air starting at 5pm…busy day! We are under a cool northerly flow in the upper atmosphere with an upper-level ridge over southern Alaska and a trough right over us. That pattern continues through Sunday/Monday. THURSDAY: Looks just like today with a mainly dry morning, then afternoon showers pop up over the hills/mountains and drift out over the valleys. Because just about all precipitation falls during the midday/afternoon, temperatures will be too warm for sticking snow below 1,000′. 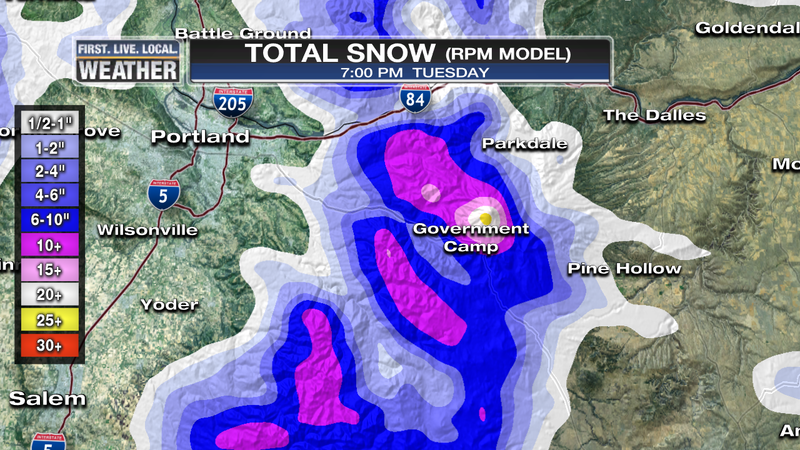 Even at that elevation you’ll be lucky to get a dusting tomorrow afternoon. SATURDAY: Should be a dry day with a chilly start then mostly sunny afternoon. No moisture for snow even though it’ll be cold enough early. As of now it appears unlikely we’ll see sledding in the metro area Friday morning; however I bet all of us will see lots of snow in the air attempting to stick at times. 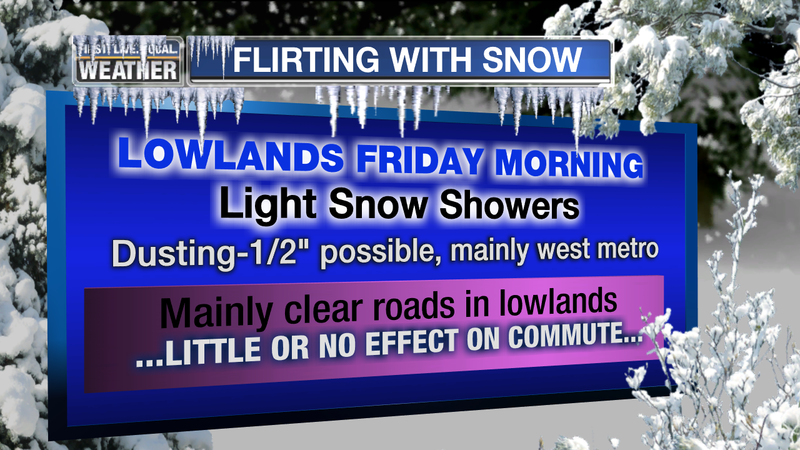 In this type of situation a mixing southerly wind often dashes our chance for sticking snow at the lowest elevations. But in this case there will be very little southerly wind since the low is coming at us from the northwest and sliding by to the west. 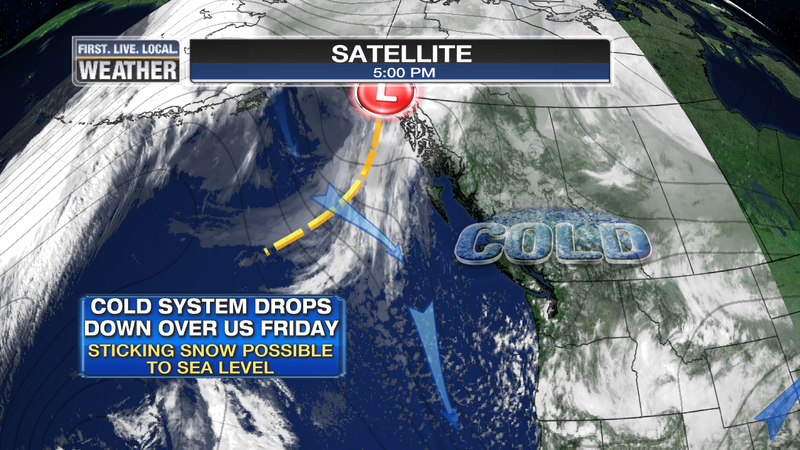 Another low moves south on Sunday which COULD give us a Friday repeat. But the atmosphere appears to be slightly warmer which may keep sticking snow up around 1,000′ and higher, or it may be just barely cold enough again…a very close call. It is very interesting that 41 out of 51 ECMWF ensemble members produce at least 2″ of snow over the Portland area by Sunday afternoon, lending some credibility to the thought that we’ll get at least a little white at some point in the next 4 days. That 2″ or more would include both Friday and/or Sunday snow combined. Beyond Sunday, the chance for snow down to 1,000′ or lower goes away for at least a few days, or for good this season…we’ll see. It’s unlikely the idea that “I’ll just drive down to Madras or Salem for the day” is going to work. I’m quite confident US 26 over Mt. Hood, US 97 through Central Oregon, or I-5 Eugene to Portland can NOT handle hundreds of thousands of people converging on the center of the state at once and then leaving a few hours later. Picture that December 14th snowstorm traffic disaster in the metro area, but spread over half the state plus you should add a few hundred thousand cars from California and Washington. Get the idea??? 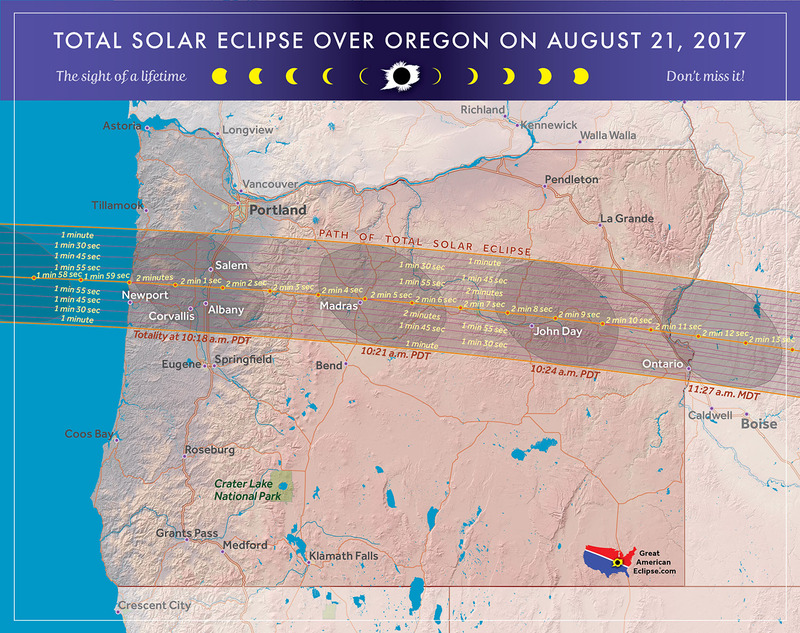 Most campgrounds and hotels have been booked for months/years within the path of totality. I have a plan to start camping at a certain somewhat remote mountain lake (lakes) starting Wednesday, 5 days ahead of time. We’ll see how that works since it’s first come-first serve at that campground. If that doesn’t work, I have one more backup plan. 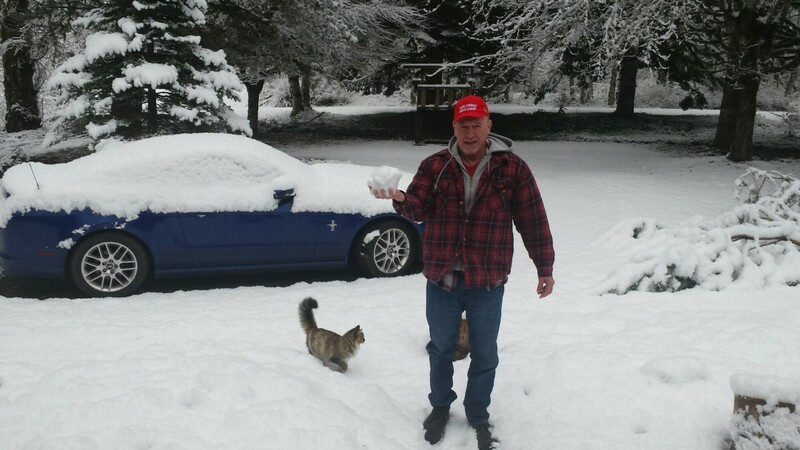 You are currently browsing the FOX 12 Weather Blog blog archives for February, 2017.